People in the poker community often come up to me and ask about whatever is on their mind. Some of these questions are good questions, and some are bad beat stories in disguise. I’ve been through quite a few things in my poker career and I like to help whenever possible, and in this new Card Player series, I’d like to share my experiences and knowledge. Feel free to ask any poker-related question, and I’ll do my best to answer it in the space below. Question: The dealers at my card room are extremely nice and, for the most part, very competent. Sometimes, though, they are a little too nice. They talk too much, slowing down the game, or they want to talk about strategy at the table. Is there something I can do about this? Gavin: Last time, I talked about how little I like it when players talk strategy at the table, so you can imagine how I feel about dealers talking strategy. It’s downright unacceptable. The other day, someone had just lost a big pot and the dealer, who had made some comment during the pre-flop action, said to another player at the table “I told him he shouldn’t have played the hand.” Now, he was saying that because there were some weird circumstances (He called out of turn for $5 and then someone made it $40 and he still called), but I don’t think that’s an excuse. I told him that I, and I’m sure other players at the table, don’t appreciate you needling the players after they lose a big pot. He argued with me, but I made sure to get the point across that players don’t need to get any advice on how they are playing or what they should do from dealers, no matter how well intentioned it is. Another time, after someone dusted off their stack in a pretty spectacular way, the dealer waited until he had left the table and made mention of how poorly he played the hand. I told him that I don’t appreciate the fact that if I make a bad play when he’s dealing, he’s going to talk about how bad that play was when I’m away from the table. I didn’t have to say anything, but I think it’s an important point to make. If players know that when they leave the table, everyone is going to talk about how poorly they played a hand, they may think twice about the decisions they make. Shame is a highly motivational emotion and most of the people that I play with aren’t stupid people overall, they just like to have a little gamble when they play cards. If they soon realize that everyone is talking about them behind their back they are going to do one of two things. Either they will take their gamble to a different casino or a different casino game, like blackjack or Pai Gow or they will try to figure out why everyone thinks they played badly and improve on that play. If the dealers are the ones instigating this type of second guessing in the players’ minds, someone needs to say something to them and that someone should probably be you. If you can, find them when they’re on break and talk to them about why you think what they’re doing is detrimental to the game. The civil, straightforward approach will almost always work and if it doesn’t, say something the next time you catch them doing it at the table. If that still doesn’t work, take it to their superior. Let them know that you have tried to talk with this particular dealer on several occasions and nothing seems to get through to them. Let the floor person know your concerns about losing a good, paying customer to another casino and you will certainly get a reaction out of them. Question: Sometimes the dealers from my card room play in the games that I play in. I don’t feel incredibly comfortable with this, but I can’t do anything about it because it’s casino policy. What should I do? I myself was a dealer almost 10 years ago. I would work Saturday through Tuesday and then I would play 2 of my 3 off days. Employees of my casino were not allowed to gamble inside the establishment so I had to go to a different casino on my days off to play. I prefer this situation because I didn’t have to worry as much about my play at the casino affecting how I was tipped. We pooled tips so it didn’t matter quite as much to me as it would to someone who keeps their own tips, but it would still make some small bit of difference. At my current home casino, they allow their employees to play while they’re off duty, and the dealers can even play when they’re working. I don’t get many dealers in the games that I play, but there are some brush and floor men who play in them. In my opinion, if they want to play in the games that I play in and attempt to take away some of my EV in the game, no matter what the quality of their service is on a regular basis, I don’t tip them. I’m not the best tipper in the first place because I only tip the dealers and floor people that are above average at their job, and then, not on every pot that I win or every day that I show up (We can get into this in a different article I suppose), but when someone attempts to cut into my livelihood and their livelihood depends on tips, I feel a need to reciprocate the sentiment. I’m sure that their outlook on playing while at work isn’t quite so adversarial, but in a zero sum game like poker, there are clear battle lines drawn. If you want to receive what you think is fair compensation for the job you are doing, don’t cross those lines. 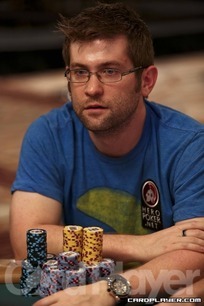 If you have a question for Gavin, send it to editor@cardplayer.com. Thanks Gavin, hopefully some dealers will read this and see a flaw in their thinking. I can't stand when a dealer comments on the game - it's inappropriate and can be a form of cheating if a friend (or co-worker) is at the table. The only plus side I saw at a famous east coast poker room (rhymes with forgata!) was that the player/friend was so engrossed in his conversation with his dealer buddy that he wasn't paying full attention to the game and made several errors - two of which were very profitable for me! I'm really curious now why you wouldn't tip every hand. Psychologically speaking, a tip is positive reinforcement for completing a hand, so tipping every hand should reinforce and speed up hand completion, making the dealer more efficient. Plenty of evidence exists stating that variable ratio schedules work better than continuous. As an example, for a VR-6 schedule, you could only tip if you rake the pot when the second-hand of your watch is between 12 and 1. About the second item, dealers playing in the games. I wonder if you you might not be missing some very important things here. First off, a great many dealers took up dealing in the first place because they were bust-out players. This generally hasn't changed, making them good for your game. Secondly, when a dealer puts his money into play at a disadvantage, he is putting the tips that you give him back into the poker economy. Think of it as a tip reimbursement program. A dealer that does not play at your room is removing that money from the poker economy. Third, many dealers will play on the clock so that he is immediately available to start a new game should the need arise. This helps the players make more money by not having to wait around for a dealers to be called in, or for the next sift to arrive. I have to agree with Greg. I have always had a lot of respect for you since you burst onto the scene 9 years ago. But for you to say that you don't tip on every hand you win unless the dealer is doing an exceptional job is pretty lousy. You were there once and you can't throw the guy a buck every time you win a pot? You should rethink your tipping philosophy sir. Even the worst dealer I have had doesn't slow the game down as much as all the players who don't pay attention to the game, cause they are texting, on a smart phone, Ipad or changing songs they are listening too. Poker is supposed to be a visual game and no one pays attention, so it slows down the game and makes the dealer have to work harder. As far as the whole tipping thing the dealer provides a service and only and only makes minimum wage so don't be so tight. Frankly, I would welcome most dealers into a game I was playing. In my experience, though limited compared to Gavin's, most dealers are splash happy with their chips and can't wait to put them into action when playing after pushing them around to other people for hours while dealing. My experience has been that dealers are good for the game as players. If they were such good players, they wouldn't need to deal in the first place. The old adage, "if there is a tie (necktie) in the game it's a good game", can equally be stated "if there is a dealer in the game, it's a good game". Being a former dealer does not mean that you have to tip well. If anything, it should cause you to tip less since you've had to sit in the break room before and listen to dealers complain about how they only got a $10 tip on a 2K pot. Whose idea was it that a poker dealer should get tipped every hand? Do you tip every single time you win a hand of blackjack. As much as we tip them, they seem to me to be very complacent and careless with exposing cards and letting the game stall. I see a lot of burn cards rank and suit. I tip bartenders and waitresses very well and they seem to appreciate it very much. I toss a dealer $3 on a $1200 pot and they glare at me like they want to stab me. Dealers seem to take the players for granted; it's nice to hear GG point out that dealers should have to provide a great service in order to receive the generous compensation tipping every hand offers. There is no such thing as a floor person. Floorman is short for floor manager. It is gender neutral. but when I do tip - I pick out the best dealers, the most attentive. I don't see the logic in tipping bad service but if you're a grinder at a Casino - at my rake it almost discourages tipping if you're a regular player. Between players and Dealers discussing anybody's action - my strategy is like Gavin's and tell them they're totally out of line - it's amazing the tranquility I have achieved from not backing down from players/dealers righteous to one's play. Good Luck at the table !!! I agree at 1-2 between the rake and tip your just not really ever getting ahead. I was at one point tipping $1 per pot won.... on avg that was $15 out of my pocket a session... just to much for someone doing their job.. also where I am at the dealers have to pull there tips which is just wrong.